Snow greeted us here in the mountains this weekend, to the glee of many. The forecast for the week is calling for some sunshine and periods of snow so come on up and enjoy some time in the mountains – it’s a great way to enjoy a day. I hope this finds you off to a good start for 2014. After a brief Christmas hiatus the Whistler real estate market appears to be off and running again loosing no steam from the end of the year. Due to a small computer glitch we were not able to review the numbers for the first week of the New Year. With this the past 2 week’s new listings, price changes and sales are now available. The week ending Jan. 12 saw 22 new listings come to market, with 14 price changes and 10 sales. 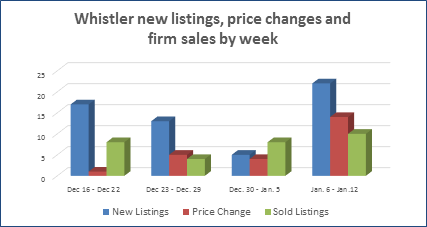 This compares to the previous week’s total of 5 new listings, 4 changes and 8 sales. This gives us 451 active chalet, condo, duplex, townhouse and vacant land listing in the Whistler area. The trend of the local market moving back to a balanced one continues. To view the past 2 weeks new listings, sales and price changes please click here. The sales comprised of 3 two bedroom quartershares ranging from $66,000 to $85,000, a studio phase II for $98,000, a studio in Creekside for $130,000, a 1 bedroom nightly rental in the village and a 2 bedroom ski in/out condo that sold for $610,000. We also saw an offer go firm on a 5 bedroom house in Baxter Creek for $2.1m. If you would like advice on buying or selling property in Whistler, please contact me – I would be happy to help answer any questions you have on the market.